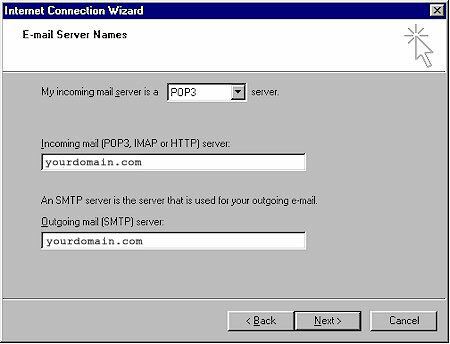 This Tutorial will walk you through setting up an email address in Microsoft Outlook Express to check a POP3 Account on jhWebWorks’ servers. 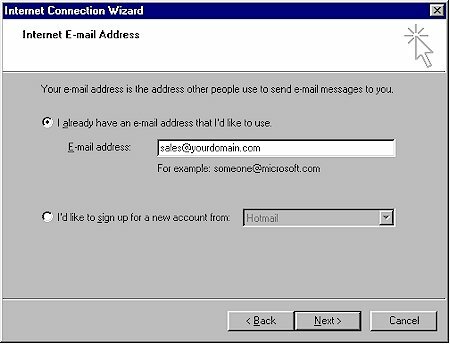 You will use the email address and password we set up for you, or you requested, on your account on our servers. 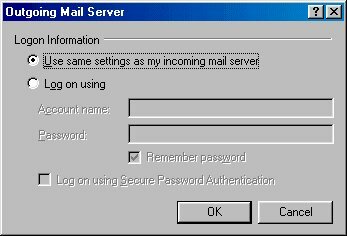 NOTE: All screenshots may not look exactly the same for all versions of Outlook Express, but they will be similar and these setting remain the same. 2) Click on the “Tools” menu from the top of Outlook Express and choose “Accounts”. 3) From the new window click the “Add” button on the top right and choose “Mail“. 4) Type in the name you want to show up for the Account Name (this can be changed later) and click “Next“. It can be the email address or however you want to identify the account. 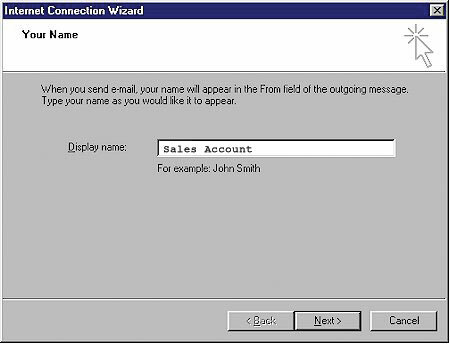 5) In this window type your complete email address (“sales@yourdomain.com” for example) and click “Next“. 6) In this window type “yourdomain.com” in both the Incoming & Outgoing boxes, click “Next“. Note: “yourdomain.com” is just an example, always replace it with Your Domain Name. 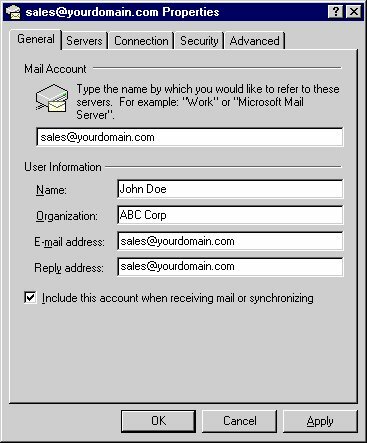 7) Now type in your complete email address (“sales@yourdomain.com” for example) for the Account name, and your password. Check the “Remember password” box so you don’t have to type it in again. Note: You should NOT check the box that says “Log on using Secure Password Authentication”. 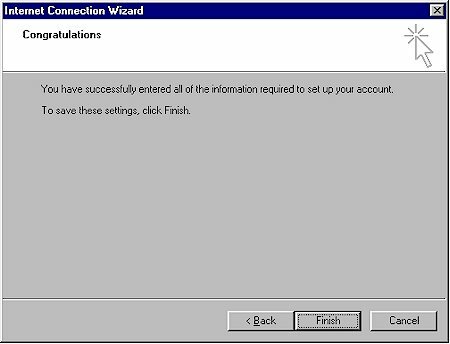 8) Hit the “Next” button and then the “Finish” button to create your account. 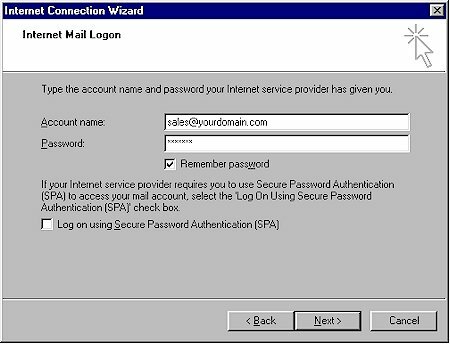 The “Internet Accounts” Window should still be open If not – click on the “Tools” menu from the top of Outlook Express, and choose “Accounts” from the pull down menu. and then click the “OK” Button. 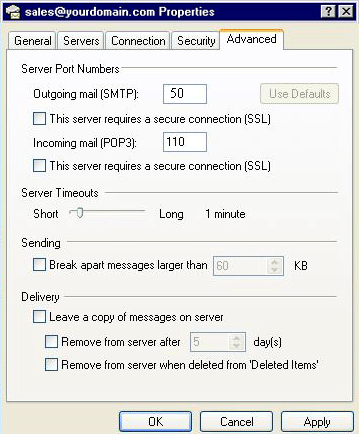 Change the “Outgoing mail (SMTP)” port number to “50”. Note: The default is usually set to “25”. 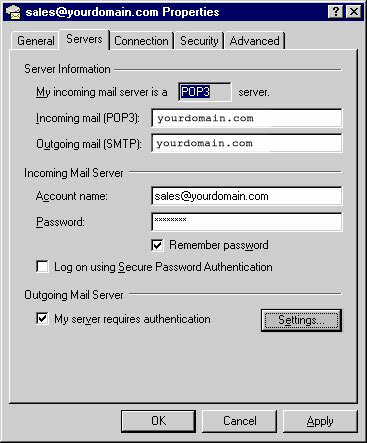 Most ISP’s block port 25 unless you are using their SMTP server, so we run on port 50. Make sure “Leave a copy of message on server” is NOT checked. Note: This is usually not necessary unless you are checking your mail from more than one computer. Please talk to us about this if you feel you need this.